The spectacular natural formation near Haines Junction has become a big draw for visitors, but experts say it's falling apart. 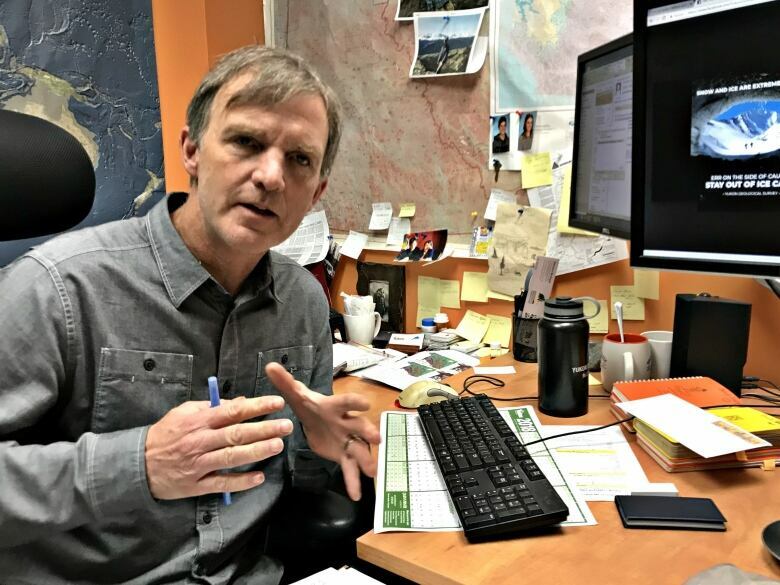 Jeff Bond of the Yukon Geological Survey says there's no doubt about it — the spectacular ice cave near Haines Junction ain't what it used to be. 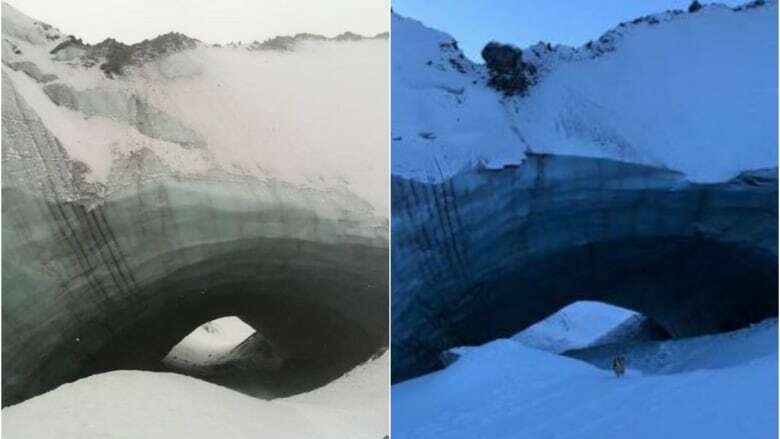 "It's definitely changing, it's... ice is peeling off on the inside, and debris is falling off the front or, you know, the entrance and the far side as well," he said. "You can see that there's a fair amount of change that occurred last summer, likely." The glacial formation was once a bit of a local secret. But word eventually got out, and by last spring there were growing crowds of hikers, skiers and snowmobilers making the trek out to see it. That prompted the Geological Survey to warn people against entering the potentially unstable cave. It's on public land, so there's nothing to stop people from going. Bond says the visible changes over the last year show that people should still stay out. "It just reaffirms our position that this is an evolving feature, and it's melting and changing," he said. "There's some large rocks that can fall off the top, and large blocks of ice that can fall within." Geologists believe the cave was formed by water under a glacier during the little ice age, a few hundred years ago. When the glacier receded, a piece was left behind. 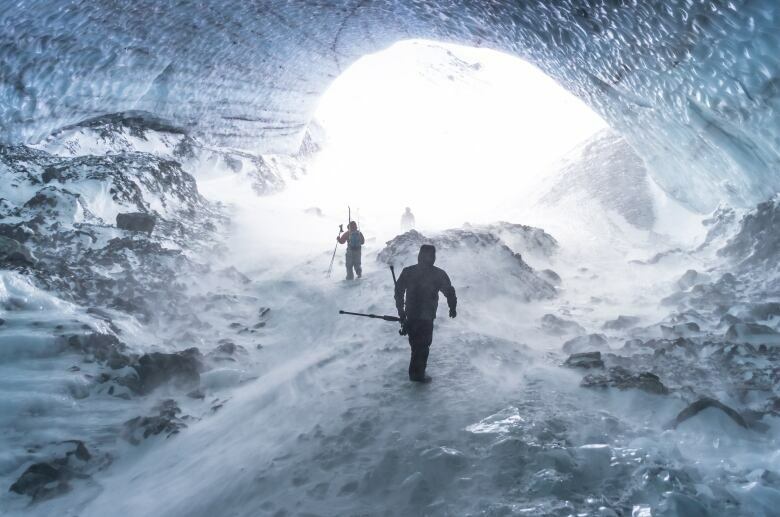 The cave is a "remnant of a sub-glacial meltwater channel," Bond says. The glacier ice is full of rocks and dirt so as it melts on top, a layer of debris starts to build. It then absorbs more solar radiation, Bond says. "Therefore, you're going to have kind of like a heating pad on top of the ice cave," he said. "There's a thinning occurring along the top for sure." Last year, geologists reviewed images and measurements taken over recent years, to determine how the cave might evolve. They said it would likely be completely melted or collapsed within five years. It could go without warning, too — especially if it's given a good shake. "We're really not that far from the Denali fault [line]," Bond said. "The earthquake activity is real in this area." Another reason to keep out, he says. "It's beautiful to look at from a distance, so it's definitely worthwhile going there — just be careful about not going inside."